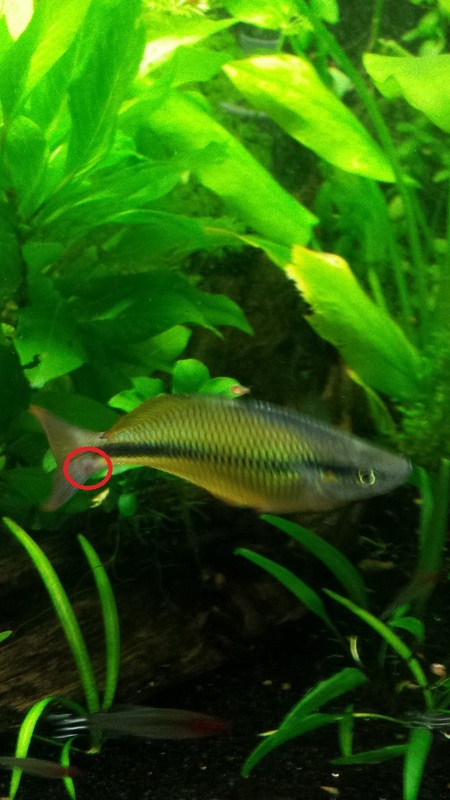 I noticed a red spot between the tail and the body of one of my yellow rainbows last week. Since he wasn't showing any strange behavior I decided to wait it out and see if it would heal. Unfortunately over the last couple weeks it has slowly gotten bigger. It actually protrudes on both sides of his body. I have attached an image. Any ideas on what this is or how I can treat it in a fully planted community tank? Nothing has changed in this tank lately, although my co2 tank had ran out about a month ago and I haven't refilled it yet. I realize this has an effect on PH and it will now be slightly higher but not too much higher because it was a very low dose of co2. No recent additions. Re: Is this a tumor? Lesions that do not heal could mean an external parasite especially if it is extruding to both sides. Hard to see. I don't think it is a tumor because of the red spot. My female betta has a tumor and what you see is that her skin slowly gets more bulgy in that area without discolouration. It becomes like a ball that is protruding and only on one side. For me however the reddish spot makes me think it is something else in your case. It's a rainbow, and farmed rainbows have a terrible reputation for being unable to fight off Mycobacter marinum - fish tuberculosis. That looks to be a possibility. Gloves on if you have cuts on your hands are getting them in the water. I will be frank - if I suspect Mycobacter sores on a rainbow, I euthanize immediately, using clove oil. I dispose of the body in the garbage, not in the water system. There is no cure. About one in three shipments to my local stores has rainbows that show Mycobacter symptoms. The fish can carry it and control it for months. When the sore shows, it becomes increasingly communicable. It's worth a google images search. Thanks Gary, I'll look into it. These weren't farm bred, I got them from a local auction but they could have it within. I'll see what I can find out! NUTS! Unfortunately, that's what it looks like. Bummer. My tanks are going to sit as it for a LONG while!!! Sorry to hear this. :s Rainbows are a favorite of mine. Sorry to hear about this - hopefully the TB has only infected the one fish! I am really sorry to hear it is fish TB! That is a real setback. Hopefully it is an isolated case. I hope so too, everyone else looks healthy. I still haven't handled it yet, however. Got busy last night and didn't get any clove oil yet. I will assess this evening. I prefer to use ice cold water as I have found clove oil slow to react. I put a recipient big enough to hold the fish wit water in the freezer. Once a small layer of ice has formed on top, I take it out and break the layer of ice. I then drop the fish in the cold water. Especially with tropical fish they are gone immediately. Sounds good, thanks for the tip! Ugh, not looking forward. I only have two males and three females. With only one male, I likely won't see as much displaying. Time to 'make' some I suppose. Now....where do I set up the breeder tank ? Sorry to hear about your troubles. I had a similar tumor on my yellow rainbow. The whole section where the tail joins the body swelled up. I ended up having to put him down too. That was depressing. I am down to a lone male turquoise and debating whether to get more rainbows. I do miss the yellows as they can be very beautiful. Hopefully the rest of yours continue to do well and maybe make more for you. Good luck! I've done a fair bit of research into this disease. The basic news is that all your fish have it now. And there is nothing you can do about it. Most of the time, they will encyst the tuberculosis bacteria and contain it, and if they don't develop any other health problems, they will more or less control it. Their lifespan will be cut radically by it (a rainbow that can normally live 9-10 years will live 3-5 with tb), and the danger point is when a sore appears on the skin, as this means a massive release of bacteria is coming - one that can overwhelm all the fish in the tank, even the ones with defences. This is why immediate euthanasia of the fish showing symptoms is necessary. If your immunity is down, you have to watch it as fish tb will cause sores if it gets in a cut, and the treatment takes a while - 5-6 months of antibiotics. Been there, done that. There are dozens of transferable dog and cat diseases, and only one fish one, but this is it. That's why I suggested gloves if you have cuts. It is very rare for it to transfer though. The doctor I saw was a Professor of Dermatology at a major teaching hospital, and mine was the first case he had ever seen, in many years of practice. UV sterilizers slow its communicable phase. I breed any rainbows I suspect may have been exposed in uv equipped tanks (I have one cheap little unit - $45 in the US, $60 in Canada)) and raise the fry away from the parents. You can break the disease cycle, and research shows that it won't cross to the next generation if you use UV during breeding and keep the young away from affected fish. It's all over the Asian farms, and pretty hard to avoid, unfortunately. It's the quiet killer of fish, often without external symptoms. I know exactly where this came in from too. Those cories I had horrible luck with. I initially bout 12, all of them dead within 48 hours. Then I bought six more healthy ones. I added another 3 to bring the total to 9 and now I'm left with seven. Whatever the source for those fish was, was not good. I guess I'll take my time trying to sort this mess out. It's unfortunate it happened in a tank with so many fish in it as they're now all carrying it. Oh well. The joys. Take the good with the bad. Thanks for the explanation Gary, appreciated as always. Gary, so does that mean that once Tb is in the tank, it is there forever, just waiting to raise it's ugly head again? As you know, I've had the same in my tank. Will it be safe to add more rainbows or should I stay away from them as they seem very susceptible. It never leaves the fish that have it, except to infect others. I don't know how long it lives in tanks without fish, but I do know it is caught by humans more in under-chlorinated swimming pools than from aquariums. I'm trying the UV approach with my rainbows. I breed them, segregate the fry from the parents forever and start with clean fish. My understanding from articles is that most farmed fish carry it. When the lesions or sores appear, as I said above, the bacteria flow out. At that point, the disease can become an acute killer, fast. Some species seem resistant. You never see symptoms, and they live long lives. Something in the evolutionary history of rainbows makes them really go down fast from tb. When they are stressed, it blossoms. When they are shipped and put in pet shops, they are stressed. I have resoved to never again buy a large rainbow from a pet shop. I'll still buy the little blue eyes, because you see them nowhere else. But Melanotaenia or Glossolepsis will come from breeders, from now on. I already strictly separate pet shop fish from wilds. If you mix them, chances are the wilds are doomed. The worst part about all this news is I don't have the mean to separate fish or move them out of this tank. It's my main display tank, unfortunately. I guess I'll have to just let it depopulate over the years and start over! Gary, are you having success with the UV method? I won't know for months. The idea is, since the pathogen is transferred by water or through the eating of dead fish, to remove all ailing fish and euthanize them, and to uv zap the water. I was able to breed 2 possibly affected species, and am rasing the young away from the parents, after the breeding was done in uv filtered water. Technically, it should allow me to keep the species even if I have lost the adults that came in carrying the disease. I really like rainbows but I'm half tempted to give up on them. They are fragile fish.